This is starting to be repetitive but Ballast Point is yet another brewery from which I have not tried any of their brews before. Wafts of tropical fruit, pine, peach and grapefruit from the pour. Big Eye IPA pours hazy amber gold with a creamy off-white head. The taste is fruity with pine, caramel, citrus, a little malt and lot and lots of hops on the sweetish intake and ending with a dry and bitter finish. Citrus and more hops linger in the long bitter aftertaste. Lowly carbonated, the mouthfeel is creamy. No alcohol shining though. 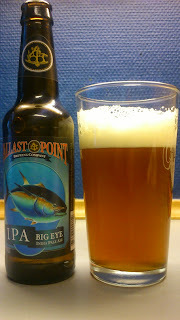 A lot lesser malt profile than the Deschutes and Tommyknocker which I've blogged recently and are still fresh in the memory. Full on with flavour without being too hop bomb heavy it is bordering on refreshing but perhaps not light enough. Yet another that I did not realize the ABV of until finished, so not a session ale. I would have no problem with buying or drinking this again. 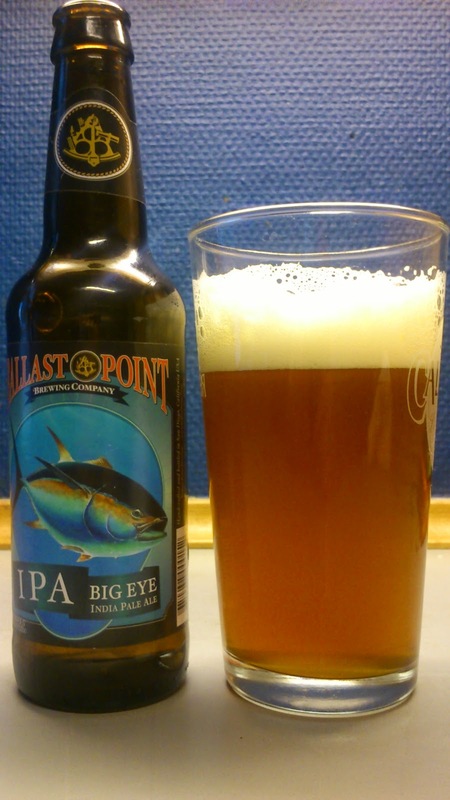 All in all, very decent IPA for a low price when bought, bargain ! This scored 7.5/10 on the 'you know you have been drinking too much of a style when it all becomes a bit too much alike' Beerometer. Where to buy CPH : Superbrugsen if still in stock, otherwise the best bet is a bottle shop.